Marvel’s solicitations for February 2015 were announced today, and for Daredevil – as we currently know him – this looks liks the beginning of the end. Here’s what the info for Daredevil #13 had to say. Mark Waid and Chis Samnee begin the climactic final chapter of their beloved, Eisner Award Winning run with the return of one of Matt Murdock’s oldest and (now) scariest enemies. Before going on, I don’t think this is a another “fake-out” like the one that ended volume three (that one was fishy from the start). I also don’t think that one of these guys is likely to stick around without the other. If this final arc is three issues long, as they most commonly have been under the direction of this creative team, then Daredevil #15 (vol 4) will probably be the last of Waid and Samnee Daredevil. With Daredevil #10 due out tomorrow, that should give us another six issues to enjoy and hopefully enough time to get used to this cruel new world in which Daredevil is Waid and Samnee-less. Joking aside, I’ve made no secret of how much I’ve enjoyed this run, going back to the very start of Daredevil (vol 3) when Mark Waid was paired with the equally brilliant Paolo Rivera and Marcos Martín. These past three and a half years have been a fantastic time to be a Daredevil fan. At the same time, this has been an incredibly long run, especially by modern standards, and I totally get the concept of feeling like a good thing has run its natural course. There is also another thing to consider, and that is the timing of this news. The Daredevil Netflix series is due to premiere next year, probably some time around May. Considering the difference in tone between a darker, more traditional, Daredevil and the lighter take on the character under Waid and Samnee, Marvel may have decided that sometime in the late spring of 2015 would be a good time to change the direction, including the creative team, of the comic. There will be plenty of reason to return to this topic, and I’m sure Marvel will have more to say about it in the coming days. Meanwhile, how do you guys feel about this? I will return tomorrow with my review of Daredevil #10, still by Mark Waid and Chris Samnee! I’m sorry to see it end. Nothing lasts forever and the new team may be excellent as well. But this is the team that hooked me with DD #18, the first Daredevil comic I ever purchased. This is the only title that, after finishing my online copy, I more often than not, groan because I have to wait a whole month to find out what comes next and, were it not for the letters page/footer that reads NEXT:________, I’d be asking Comixology to confirm that they uploaded all the pages. Even the weaker issues have been better than my average reads. Sigh. I’m going to be keeping an eye out for more Waid and Samnee projects (jointly or separately). They’re both on a very very short list of creators I’ll follow regardless of title, because even if I don’t know much about the chararcter/book they’re doing, they stand a good chance of selling me on something new. Christine: I second, nothing lasts forever, and at least Waid is leaving on a high point. Do you have any information as to whom the book will be handled to?. Be well. I should say that I’ve already posted these comments elsewhere. I’m sorry if they come off as redundant, but they do sum up my feelings on the news. If it is true, I’m very sad to see it end. Waid’s run has had some very nasty things said about it on some of the boards, but I believe it’s been marvelous (I think Matt publicly outing his secret ID was one of the bravest and best things that has happened to the book in a long time – I hope it isn’t retconned later) and I’m keen on seeing what the future holds for DD. I am a bit wary of Marvel immediately shifting the book’s tone to be more in line with the upcoming Netflix series; if that is their decision a gradual transition may work better. Although I wouldn’t necessarily give the book up, I would really be very disappointed if the next team chooses to ignore this run in an effort to restore the status quo instead of actually building on it. But if this long rumored “Marvel reboot” thing actually happens, then I’m through. Chris Samnee’s artwork has been absolutely exemplary. I was (unfortunately) unaware of what he had done prior to DD, so his drawings really took me by surprise. If this run can be said to have had a real breakout figure it’s him. My only regret is not seeing him do a B&W Daredevil story but then, he’s not finished yet either. I’m happy about this. I’ve really enjoyed Waid’s run overall and consider him to be one of the best DD writers ever (a very, very distant 4th behind Miller, Bendis, and Brubaker), but a four year run is enough. Time to let someone else take the reigns wherever they may lead. I’ve loved about 80% of what Mark Waid has done with the characters, but the other 20% makes me want to throw the book out the window. I hope the next writer brings back a more mature and professional Matt Murdock and Foggy Nelson, and a Daredevil who is a more seasoned warrior again. And yes by that I mean a martial artist/ninja. I’d love to see Greg Rucka take a stab at Daredevil. Or Jeff Lemire whose amazing and all too brief Green Arrow run made me really want to see him take on Daredevil at some point. Also I’m probably in the minority around here, but I actually kinda hope Marvel will do a reboot of their universe come spring. I highly doubt they will, but think it would be for the best if they somehow did. The whole universe is too convoluted and the way they pick and choose what parts of their history they acknowledge is getting ridiculous. I think it is great news. The last couple of issues Waid’s writing been off for me. You can feel that his run has been losing some of it’s steam since the beginning of his run. I hope he finishes his run on a high note. I really think that a marvel reboot is the reason for of all of this. Except with this reboot there gonna pick and choose from everthing (all the other alternate versions) to make a new marvel. If I was a betting man I will go on record and say that the new creative team taking over will be Hayden Blackman and Del Mondo. Feb is the last issue of Elektra. Alonso has already stated that they will be doing another book for them. I’m thinking it might be Charles Soule, coming off of his She-Hulk run. He did a pretty decent job on Matt’s guest appearances in that book, he’s a lawyer as well as a writer. I do hope that if he comes on board, it will be with an artist who’s style differs from what Pullido gave us in She-Hulk. I think Waid fixed a lot of issues with this book. Especially following the Shadowland fiasco. It would be a mistake for a creator to try to debunk or let go of the awesome work he’s done. It should be built on. I certainly don’t think they should try to match it with the Netflix show. If this is the creative teams final run then I enjoyed the title immense and I will be sorry to see them leave. Waid’s run has been very exciting and different, a welcome different. I don’t really think Waid’s run has been all that light. The artwork and colors are brighter than previous runs however Waid has mentioned repeatedly, through Foggy, that Matt is only acting happy. And after reading DD for many years the dark undertones to Matts personality are there. I think Waid can do another few years on the title and make it interesting still. I understand Marvel wanting to reboot the title with a new number 1 and creative team as the tv series begins. My vote for writer would be Lemire, as his Green Arrow run, as others mentioned, was excellent. Soule would be my second pick. He just signed a Marvel contract, from what I read. There are several artists I’d like to see on DD new and old. A Lee Weeks return to the title would be nice. A Mazzucchelli return would be a nice surprise. Fan fiction hopes however. It might be best to let this era of Daredevil pass and remembered as it’s own self contained world. Fifty plus issues are quite a treat in this day age. I don’t think I would enjoy someone else trying to do their version of Waid’s DD. Yeah. It had to happen sometime but…waaah. I just hope the new team is good. I’m pretty devastated about the news. It’s frustrating that there’s been no official word from Marvel yet as to whether it’s both Waid and Samnee leaving the book, or one or the other. As well as exactly how many issues they have left (here’s hoping that they stretch the last arc out to atleast five issues!). I’ve actually been stockpiling the Samnee issues (and as such have only read issues 1:50, 6 and 7 of the current run), to read as a little reward for myself once I acheived a personal goal of mine, so I still have lots of Samnee Daredevil goodness to look forward to. But still…. hearts have been broken, tears have been shed. I think the time is right to wind down their run. I haven’t been particularly impressed with DD’s move to SF and think the title has dragged a bit lately. The art is still lovely, of course, but I think that story-wise, the title could use some freshening. That said, this has still been a favorite era because Bendis/Bru/Diggle et all really over-hammered the darkness and despair and we needed a break from that. I have no doubt the title is going back to basics after Waid leaves, I just hope what we get isn’t too generic. I would love to see Nathan Edmonson write DD as he’s done a great job revitalizing The Punisher and that comic has a tone that could also work here. Have someone noticed some possible hint at something in the letters section to issue 10? The capital in “Untold Stories” may be something. 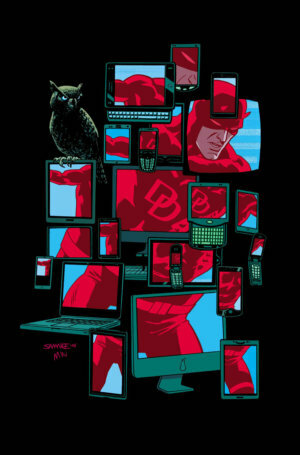 Now that the Netflix series is coming, and that some Waidphobes are screaming for a return of the status quo, if possible ignoring everything the “Waid cancer” has done to “destroy Daredevil”, it would be interesting to use Matt memories as a plot device to, let’s say, launch a second series about Daredevil, some “Daredevil Untold Stories” set in New York and ignoring the Waid run, since it happens IN THE FUTURE. It would be aimed at the series viewers, who would pick this up and possibly the main Daredevil title. After letting Waid write an issue about a 50 years old Matt, with a son and married to someone, and most importantly, living in SF, I don’t see how they would reverse everything. I just don’t see how “Matt being a NY attorney with a secret identity” could work anymore. Excuse me for the nerdy speculation. Isaac, they also let Bendis write a future story where Daredevil has lots of illegitimate kids and is dead. Stories in the future are never set in stone. How many future versions of Batman are there? or future X-men? Mark Waid and Chris Samnee have done right by Jack and Maggie’s boy. Best wishes on their next projects. I hope they change it back. Didn’t like Waid at all, he disregarded a decade’s worth of character building. Bring on a new writer. Well given the whole “Secret Wars” thing Charles Soule could actually go back to a pre “Murdock Papers” or even pre-Miller continuity. Much in the way Lemire made Green Arrow work in the “New 52”, I think a total back to basics start would be good. If anything “Shadowland” proved that DD was a mess. I love the idea of having him be something other than Marvel’s whipping boy and poster child for abstinence. Frankly I am sick of the weight of DD continuity and the trail of tears. If Soule went back to NYC and started fresh with Matt, Karen and Foggy I would love it. Especially if he kept the villains rooted to the streets. DD never needed to be in space, fighting aliens or the supernatural. There is plenty to fear on the streets still. If not Soule then Lemire please. Is it confirmed that Soule is taking over after Waid leaves. @kyle: I haven’t heard any news about who will take the reins next, but I would love for it to be Soule. Daredevil # 15 came out last week (5/20/15) with the 2 covers. Is that the last issue by Waid? I meant # 15.1 came out last week. Same question; is that the last Waid issue? No, Daredevil #18 will be their last. Since this announcement was made, some issues have been pushed back. Originally #15 and #15.1 were supposed to come out at the same time, and one or two later issues have been pushed back as well, so there won’t be a new creative team until fall. I suggest going to manwithoutfear.com, and scrolling down to where he lists all known shipping dates. That should answer any other questions! Thank you! Great site – by the way! I can’t believe how much I loved Waid’s run. There were many genuine laugh out loud moments. Kirsten relishing the fact that she has her own arch nemesis was one. Daredevil #10 had me in tears… in tears when he opens with Matt describing depression and ends its with those last panels. having suffered from clinical depression for so long… this one hit me hard. The irony of Waid’s run is that it gets flack for being “lighter” but its actually Waid’s run that really delved into the darkness and the mental toll it takes on Matt. I was not expecting that ending on #17. I have yet to get #18 and its a bit bittersweet.